Jeff Bezos 1, Seattle Homeless 0. Now What? Advocates are regrouping after city officials knuckled under to pressure from Amazon and repealed a tax on big employers. Cities around the United States are facing unprecedented crises of homelessness and housing insecurity, as escalating housing costs collide with stagnant wages and decades of cuts to social safety net programs. Last fall in Seattle, a coalition of grassroots and progressive organizations called Housing For All came together to push our city to do better. We quickly emboldened members of Seattle’s City Council to put forward a proposal that would tackle not just homelessness, but also our regressive tax system: the City’s largest businesses would be required to contribute funding for housing and shelter. Mega-corporations like Amazon, which are driving and benefitting from our region’s rapid growth, and which also just got a big Trump tax break, would pay a modest per-employee tax to help mitigate the worst impacts of that growth. After eight months of coalition-building, demonstrations and direct actions, task forces and public meetings, emails, phone calls, and testimony, five of the nine city councilmembers were prepared to vote for legislation that would raise an ambitious – though still inadequate – $75 million per year from the highest-grossing 3 percent of businesses. We thought we were on our way. The homelessness state of emergency continues and is more urgent than ever. Then all hell broke loose. Amazon issued their now-infamous threat, and fear seemed to shift public opinion overnight. Socialists marched on the Spheres, building trade unions went into a frenzy, and Mayor Jenny Durkan brokered a last-minute compromise that would net $47 million per year and end after five years. The new bill thrilled no one, but on May 14 it sailed through the City Council and for a moment it seemed the fight was over. We were wrong. Within 24 hours, business lobby groups and corporations had rallied and resolved to fund a repeal campaign. Teaming up with anti-tax neighborhood groups that blame the homelessness crisis on “government waste” and on homeless people themselves, they set to work gathering the signatures needed to bump the legislation to the November ballot. The “No Tax on Jobs” campaign hired conservative consulting firm Morning in America, paid petitioners up to $6 per signature, and was happy to play fast and loose with the truth. Despite our best efforts, as the June 14 deadline neared, it became clear they had succeeded. We began to steel ourselves for the ballot battle ahead. Then the final blow landed. In a special meeting on the afternoon of Tuesday, June 12, city councilmembers voted 7-2 to repeal the big business tax they had passed unanimously just four weeks before. Only Councilmembers Teresa Mosqueda and Kshama Sawant resisted the turnaround. 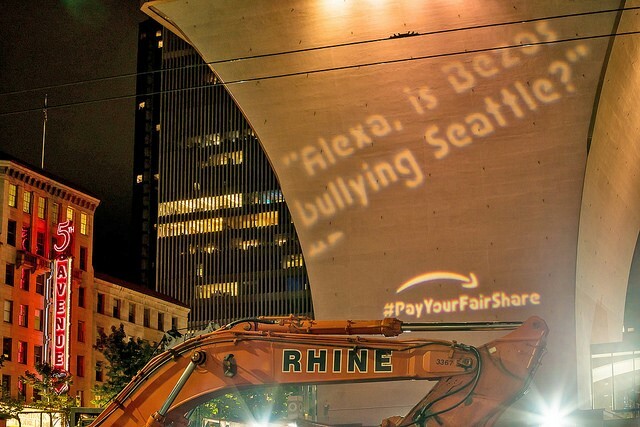 National news quickly filled with blistering headlines, slamming Seattle’s swift capitulation to Amazon’s bullying tactics. There’s no sugarcoating it: we lost. But progress is never easy or achieved without failure and the courage to persist through failure. We set out to do something big. Over the past nine months we have disrupted a status quo that protects the wealth and privilege of the few and leaves the rest of us fighting each other for scraps. What is remarkable is that we got so close. Our challenge now is to draw lessons from this experience, regroup, and move forward. Next time we will be smarter and stronger and we will win. In the wake of the repeal vote, many of us felt not just deep disappointment but anger and a sense of betrayal – how could our progressive allies on the city council, who stood with us and worked with us over the past nine months, cave so suddenly and so completely? At least three of the councilmembers who voted to repeal the legislation – Lisa Herbold, Mike O’Brien, and Lorena González – did not do so because they changed their minds about it being good policy or the right thing to do. They did so because they knew that the big business-funded referendum push had gathered enough signatures to make the ballot; and they saw ahead five more brutal months of a multi-million-dollar propaganda war ending, they believed, almost inevitably in defeat. Over the past nine months, big business lobby groups like the Greater Seattle Chamber of Commerce and the Downtown Seattle Association have offered no solutions. Instead they poured their vast resources into a media campaign to discredit the city council in the eyes of the public, and spread misinformation about the tax and the homelessness crisis. They cynically manipulated many Seattleites’ legitimate concerns about rising property taxes and the impact of homelessness on their neighborhoods, to inflame prejudice and weasel out of making a modest contribution toward real solutions. They made Seattle an uglier place. They know very well that new resources are needed to address homelessness – and yet they have had no qualms about denying this again and again. They have drowned out facts with well-funded lies. They succeeded, it seems, in turning the tide of “public opinion” – at least among likely voters. Seeing this, councilmembers chose to cut their losses and start over. Whether we call their choice cowardly or sensible, we have to admit this outcome reflects the real power dynamics in our city. We – the Transit Riders Union and our allies – have built up enough people-power to push groundbreaking legislation through the city council. That’s no small accomplishment. But we don’t yet have the power to back it up. We simply weren’t able to counter the influence of big money on public opinion. We don’t yet have the ability to reach enough of our neighbors, to have enough conversations that change hearts and minds, to effectively counter the destructive and petty narratives that divide us rather than unite us. The challenge before us is to build this kind of power, to organize more broadly and more deeply. No one can stop us from doing this. It is the challenge of our times, and together we will rise to it. Amazon, Starbucks, Vulcan, and the big business lobby groups got their way. They “won.” Who lost? Most of all, our neighbors experiencing homelessness: low-income seniors, veterans, at-risk youth, people struggling with mental health or substance use challenges, and people with disabilities, whose one shared characteristic is that they cannot afford a roof over their head in this insane housing market. The homelessness state of emergency continues and is more urgent than ever. Our regressive tax system continues and the need for progressive revenue is more urgent than ever. There is simply no acceptable solution but for big businesses and the wealthy to start chipping in. They can’t avoid this social responsibility forever, and we’ll keep working to make sure that day of reckoning comes sooner rather than later. Katie Wilson is the General Secretary of the Seattle Transit Riders Union and a coordinator of the Housing For All Coalition.